First up is Chaos & Crocodiles Oblizzerated, a mix of blue and silver glitters. I layered it over Girly Bits A Twinkle in Time, a silvery holo with blue glitter accents, from the December Box Indied. So pretty and wintry! 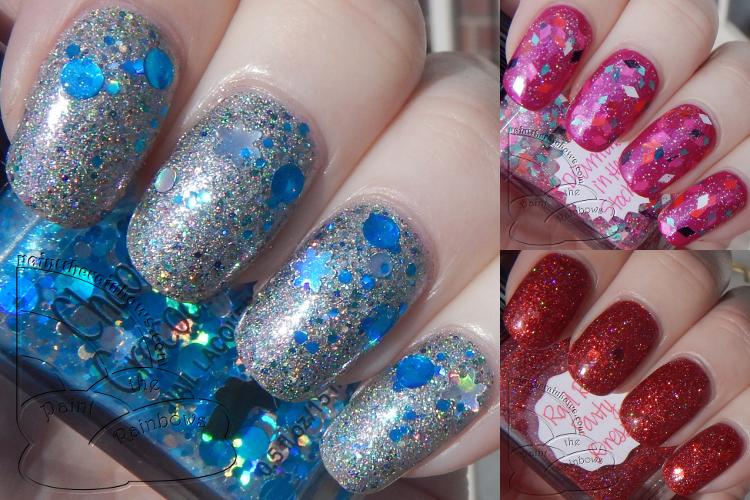 Next up is Lynnderella Diamonds in Her Stocking, a mix of various colors of diamond glitters and silver holo microglitter. I layered it over Elevation Polish Purple Queen Anthias, a shimmery magenta. So pretty! This glitter reminds me of a super girly argyle Christmas sweater. Last is Lynnderella Rad Red Party Dress, a red microglitter with red glitter accents in various shapes. I layered it over a Different Dimension Walking in a Winter Indieland, a red holo, but I think it might be able to get opaque on its own - none of the base color shows through the glitter. So festive! That first manicure is absolutely stunning!